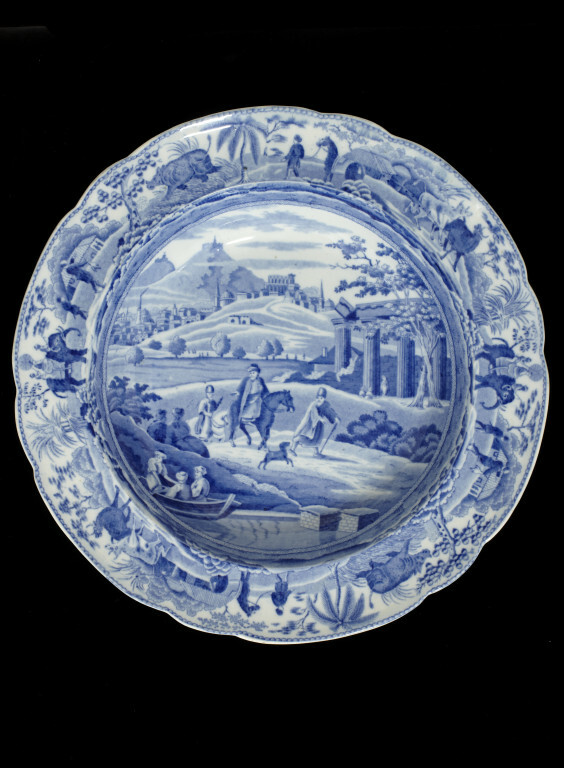 Soup plate of earthenware transfer-printed in underglaze blue with the 'City of Corinth'. Two horsemen are shown travelling away from the city, and with a man walking ahead with a dog. The border is decorated with animals and figures. 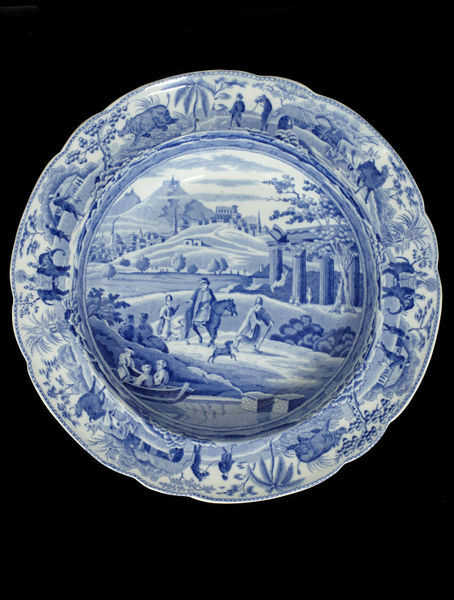 The 'City of Corinth' is from the Spode 'Caramanian' series. 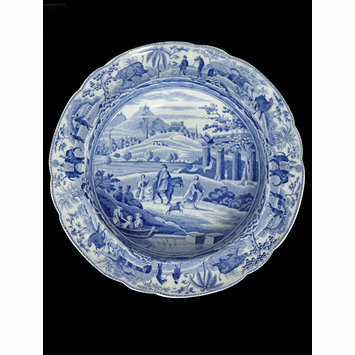 The border is derived from plates in Captain Thomas Williamson's 'Oriental Field Sports' (1805-1897). The main scene is taken from engravings in Luigi Mayer's 'Views in Egypt, Palestine and the Ottoman Empire' (1801-1804). Spode's Caramanian Series patterns are not named on the pieces themselves; the names are derived from their source prints. Caramania refers to the ancient name for an area on the southern coast of Turkey now known as the "turquoise coast". Spode also issued several variations on the patterns. The series was first produced c. 1809. The border figures for the Caramanian Series come from illustrations by Samuel Howitt in "Oriental Field Sports", published in 1807. That book was the source for the border and central scenes of Spode's Indian Sporting Series, which was copied by other makers. The animals on the border are different for each of the two series. For extensive material on both of these series, see Williams1943 and DrakardHoldway1983. Illustrated in Coysh1970 p. 73, #88; and in DrakardHoldway1983, p. 162, and DrakardHoldway2002, p.245 (P905-13). 'City of Corinth' from 'Caramanian' series, pattern number 905-13.